A full-size model of a NASA space shuttle may soon journey on the waterways of the United States, embarking on a mission of education and "Inspiration." The mock-up orbiter "Inspiration," which for two decades sat parked outside the Astronaut Hall of Fame in Florida, west of NASA's Kennedy Space Center, will depart on its first move as soon as Saturday morning (Jan. 16) to begin its transformation into an educational outreach tool and the showpiece for a company developing new communications technologies for future missions into deep space. "It is kind of an educational and promotional thing," stated John Pederson, the chief executive officer of LVX System, which has an agreement with NASA to study applications for visual light communication — using LED light to stream data — for missions to Mars and other destinations. Space Camp Florida apparently used the crew cabin for simulated missions aboard "Endeavour" (and Endeavour was at one time written on the starboard wing). In the mid to late 2000s, the crew cabin was upgraded to feature an even more detailed flight deck and middeck. The payload bay was originally open to the public as the "Shuttle to Tomorrow." As described in the article, it housed a 72-seat theater for what today would be called a 4D movie: the seats rumbled for launch and other effects immersed you in a spaceflight (though nothing to the extent or effectiveness of the Shuttle Launch Experience). John Glenn (appearing in the film) was the commander of the mission. Are there any photos of the inside of it when it was being used? When did they close it to the public? I was there in 2011 and it looked like it'd been closed to the public for a long time, even then. I remember being in the payload bay "theater" back in the early 90's. I believe the 4D experience also included the front of the shuttle raising up which gently pushed you back into the seats to create some liftoff G force. I may have some photos somewhere, I'll take a look. My memory is pretty hazy, but I went to Space Camp there maybe 20 years ago now. The culmination of the program was the simulated flight, which took place in the front simulated cockpit here. I really wish I could remember more now; I doubt I have any photos but if I find any I'll post them. Perhaps someone else has some photos of the cockpit. I'd love to see it again. And I'm curious what it looks like today. I remember "shortly" before this moved to near the water at Kennedy Space Center, I was lamenting that we could have gone inside as we were just there a few months prior, but opted to do SLE again. However, I don't know whether it was closed or open to the public. The Inspiration has been in the same place outside the Astronaut Hall of Fame for 20 years. Prior to that, it didn't exist. The space shuttle mockup you are thinking of is the Independence, formerly the Explorer, which was moved from the Kennedy Space Center Visitor Complex to the Complex 39 turn basin before departing by barge to Space Center Houston. 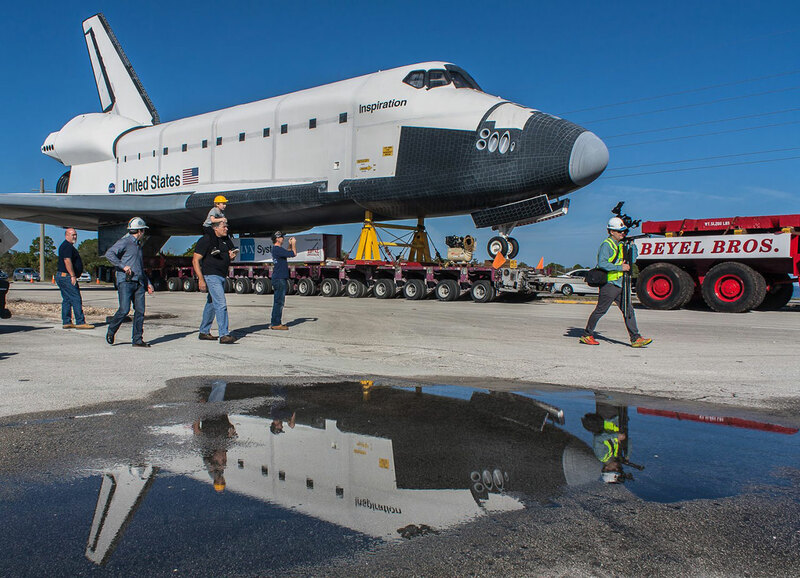 "Inspiration," a full-scale space shuttle model that for two decades stood along the state road leading into NASA's Kennedy Space Center in Florida, rolled, and then floated away on Saturday (Jan. 16), beginning its journey towards becoming a traveling exhibit and marketing showpiece. 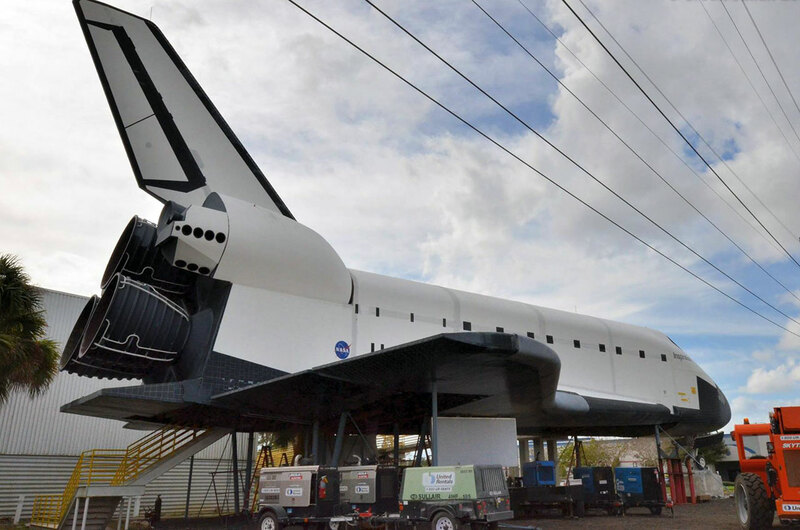 The 122-foot-long mockup, which at one time housed a theater and simulator, left its mount outside the former Space Camp Florida and U.S. Astronaut Hall of Fame facility in Titusville just after 9:30 a.m. EST. Riding on a multi-wheeled transporter to a barge about a half mile away on the shore of the Indian River, the "Inspiration" left on a four hour trip across the water to a Beyel Brothers Crane and Rigging's work yard on Merritt Island, where it will spend upwards of a year being repaired and upgraded for its new mission. Photo gallery presented in collaboration with AmericaSpace. 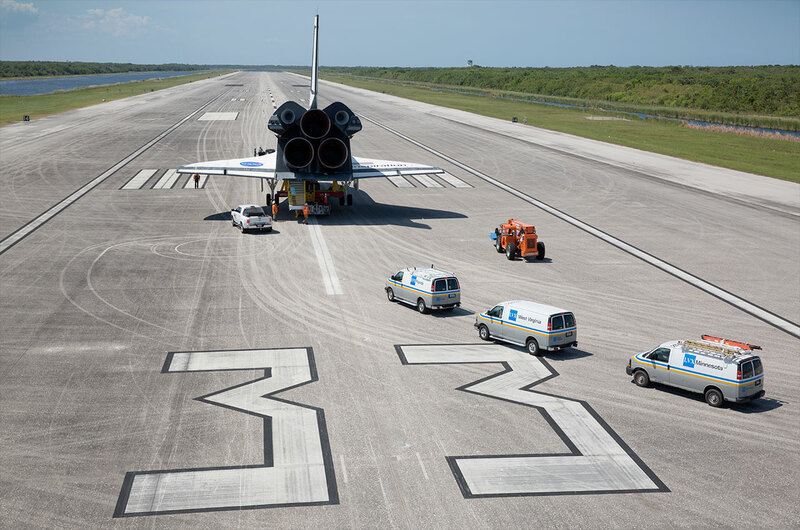 Almost five years after NASA's last space shuttle landed in Florida, an orbiter returned to the runway at the Kennedy Space Center. The model orbiter "Inspiration" was rolled out to Kennedy's Shuttle Landing Facility on Wednesday (April 27), where it will be rebuilt into a traveling exhibit. The full-scale mockup was previously on display at the now-former location of the U.S. Astronaut Hall of Fame in Titusville. Looks like she got a decent set of landing gear from the photo. Are there any photos showing this from the opposite side? Why'd they go to the trouble of wheeling it out onto the runway, was it to get photos of it sitting there? I couldn't imagine a tour group going through there as this was going on as some of the KSC tours do roll right up to the gate to the runway at the control tower there. Imagine the looks of people on the bus, seeing that sitting there! LVX System (and Beyel Brothers) are using an apron off to the side of the runway as a workspace to perform the upgrades to Inspiration. It will be there for the next year as the work is completed. I'm a little baffled on what the plans call for the "Inspiration" space shuttle on the SLF. The SLF apron (concrete parking space) is being used as a work area, that's all. It will be where the modifications are made to Inspiration so that it becomes a traveling exhibit. Would it be visible on the KSCVC tour that goes to the SLF? I asked LVX System this question and they deferred to the Kennedy Space Center Visitor Complex for the answer. The KSCVC site does not mention the SLF on the Explore tour anymore. Maybe it doesn't even go there. Anyway, I will find out May 15. The Explore tour does not go to the shuttle runway any more. So no way to see Inspiration on a public tour.